I was in Setabo village yesterday and told the story of Jesus’ crucifixion, focusing on the fact that Jesus willingly took all the sins of the world on himself and the need to acknowledge our own sinfulness. Rom and her husband, Leang, were really impacted by the story and my testimony of being made new by the power of the Holy Spirit once I acknowledged that I couldn’t save myself. Tu, Rom’s mother, who was the one who requested to learn about Jesus last year, seems to have hardened her heart already. She immediately wanted to tell us that something similar happens to anyone who believes whole-heartedly in any religion. 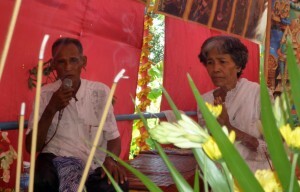 I began interceeding for her and binding the work of lying spirits over her during my motorbike ride back to Phnom Penh. Today I’ve had a dreadful day with my pda/phone dying and potentially losing heaps of data, my water filter/cooler getting fixed by incompetant tradesmen and now producing un-drinkable, glue tasting water, as well as not being able to accomplish any of the important tasks I needed to do today. I just realized that I’m under spiritual attack and the way forward is in lifting up Jesus and his victory over my life and Tu’s life. Please join in praying with me and for me.